John was a member of the HAMG from the beginning. He was always keen to have a memorial built at RAF Sawbridgeworth which was very near his home in Allens Green, where he used to watch the activities from the airfield as a boy. John died in August 2012. Our good friend Fred died on 18th September 2018. For many years he was chairman of Nazeing RAFA, and was always supportive of the group’s efforts, attending many memorial services and helping to raise money for the memorials. Roy Howe, a great friend and supporter of the HAMG, died on 10th December 2015. Roy served in the Second World War as an airframe fitter with 38 Group RAF on Stirling and Halifax aircraft and was a standard bearer for the Nazeing RAFA. He proudly attended all the group’s memorial events until illness prevented him from doing so. Trevor Edwards died on the 23rd June 2015 aged 74. Trevor had laid a wreath on the Hunsdon airfield memorial since 2006 on behalf of the Lodge Of The Legion, and through his many masonic contacts helped us to raise the necessary funding towards the Hunsdon Roll of Honour memorial dedicated in June 2012. Trevor assisted in the unveiling of the Roll of Honour memorial, and was a member of the Hunsdon Microlight Club. 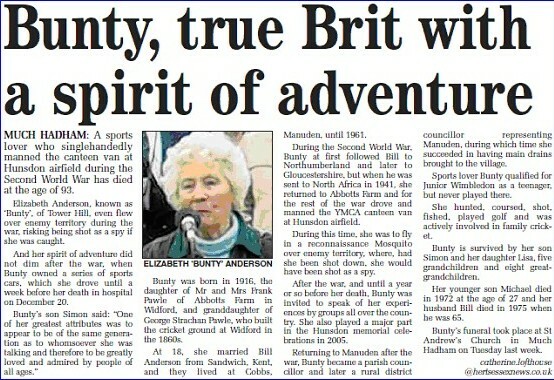 Bunty Anderson passed away on 20th December 2009 at the age of 93. Bunty drove and worked the YWCA canteen van at RAF Hunsdon throughout the war and took part in the memorial dedication in 2005. Fred Hitching, the co-author of ‘The Royal Air Force at Hunsdon 1941-1945’, died on 30th October 2011. 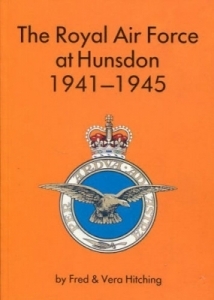 Along with his wife Vera, he wrote the highly informative and interesting book of the history of RAF Hunsdon published in 1990. Fred took part in the Hunsdon memorial dedication in 2005. Squadron Leader Tom Bennett passed away in February 2013 at the age of 93. Tom gave a talk on life in Bomber Command on the second of our fundraising evenings at Hunsdon Village Hall in April 2005. Sqn Ldr Ivor Harris passed away in 2011 at the age of 90. Ivor led the Act of Remembrance at the RAF Sawbridgeworth memorial service in May 2006. Max died on 13th June 2013 at the age of 92. He was the last surviving pilot who flew on the Amiens Prison raid, Click HERE to see Max being interviewed by Martin Shaw for the BBC documentary ‘Operation Jericho’. Flt Lt Eric Atkins DFC* KW* passed away on 22nd November 2011 at the age of 90. Serving at Hunsdon with 464 (RAAF) Sqn in 1944, Eric was the founder and chairman of the Mosquito Aircrew Association. He led the Act of Remembrance at the unveiling and dedication of the Hunsdon memorial in 2005. Revd. Stephens passed away on the 26th May 2015 at the age of 90. He was based at RAF Hunsdon with 29 Squadron’s photographic unit in 1944. He gave the introduction at the memorial service at Hunsdon in May 2005. Wing Commander Branse Burbridge DSO* DFC*, the RAF’s top scoring night fighter pilot of WW2, died on 9th November 2016. We had the honour of him taking part in the dedication service of the RAF Hunsdon memorial in 2005.